Researching voting rights in Othello and Quincy, WA, I sought to answer the following questions: 1) Has the system of elections caused minority vote dilution in past elections? 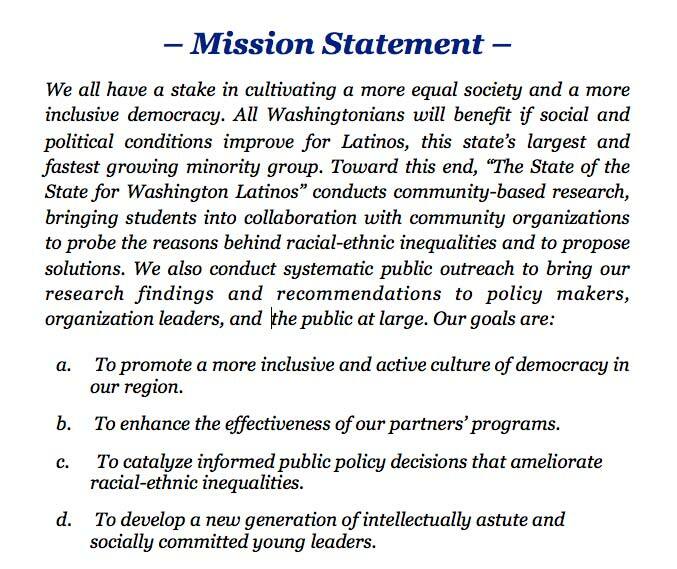 2) How does the political culture influence Latino participation? 3) How do other factors, such as the existence of bilingual election materials and outreach, affect Latino representation? Methods: In order to determine whether minority vote dilution had occurred through racially polarized voting in the at-large City Council elections in these cities, I obtained voter files and election results for selected elections during the past fifteen years. With this information I was able to discern the number of Latinos who had turned out and participated in each election, the number of non-Latinos who had turned out to vote, and the number of Latino and non-Latinos registered voters. I was also able to determine the success rate of Latino candidates in city elections. As a result of this data I was then able to correlate the support for Latino candidates with the proportion of Latino voters for each precinct and thereby determine whether racially polarized voting had occurred. I also examined the barriers to Latino voting that naturalization requirements pose to non-citizens. Quincy and Othello city council elections do not show evidence of racially polarized voting, so creating district elections may not solve the problem of low representation. Fewer Latinos are registered to vote than non-Latinos. Latinos are not participating in elections at rates comparable to non-Latinos, and they vote at rates here that are below national averages. Latinos are significantly underrepresented in local government. Candidates should do more outreach to Latino voters. County Auditors should coordinate their Latino voter outreach efforts with established local organizations serving Latinos. County Auditors should hire Bilingual Program Coordinators. County Auditors should coordinate Latino voter registration programs with the federal agencies that administer naturalization requirements.